Leveling, steaming and compacting calendar, for the enhancement and completion of finishing plants for quality knitted fabrics. We provide our customers an excellent quality range of Relax Dryer Machines. These can be customized to suit various needs and requirements of our clients. - suitable for tubular, open width knit as woven fabrics, whether natural or synthetic based. - perfect tensionless conveying system offerslowest residual shrinkage. - possible for both drying & hear treatment. - suitable steam, oil, gas heating system. Owing to our enriched industrial experiences, we are committed to providing a wide variety of excellent quality Relax Dryers. Our clients can avail from us Relax Dryer Machine that is designed to suit the varied needs of our clients. These products are manufactured by us by using quality proven material. Our company presents a very unique range of Conveyor Relax Dryer. Insulators are fitted to save these Dryers from high voltage of electricity. Relax Dryers work with the Air Circulation technology and are fitted with air nozzles which ensure the proper circulation of air. Relax dryer offers the perfect, and shrink less fabrics. Relax Dryer Exolloys tensionless conveyor dryer for knitted and woven fabrics is treated under the total relax form, on the conveyor belts, with tumbling movements, for achieving the dimensional stability by means of overfeed to obtain length shrinkage, better handle & bulking to the fabric. We have carved a niche amongst the most trusted names in this business, engaged in offering comprehensive range of Relax Dryer. we are please to introduce ourselves as a leading manufacturer of PTFE (TEFLON) Coated glass fabric belts, which are used in rotary printing machine dryer and relax dryer. Our clients can avail from us Relax Dryer that is designed to suit the varied needs of our clients. These products are manufactured by our trusted vendors using quality proven material. 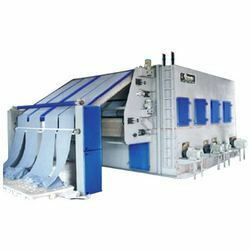 Designed as per the latest market norms, these dryers are widely appreciated among our clients for the technical features.